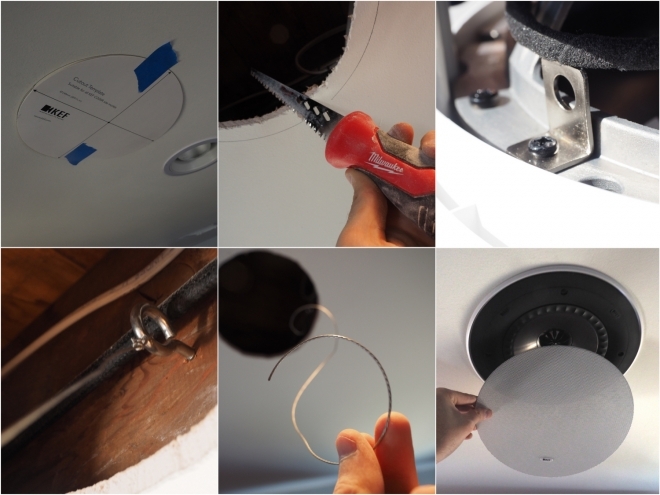 Michael Palmer from HighDefDigest.com installed and reviewed the KEF Ci200RR-THX in-ceiling speaker. I honestly had no idea what I was missing until I was no longer missing it. My first demo when rewiring or setting up a new Atmos configuration is a Dolby Atmos Demo Blu-ray. In addition to trailers and short films, it also includes the Enrique Iglesias music video for 'Bailando'. A catchy tune, for sure, but in Atmos, it's remarkable. Instruments and voices -- as individual objects -- pop up in random speakers overhead and in the surrounds. As a whole, it's a fun presentation, but I also like to stand close to each speaker to see what that amplified-channel is doing. The moment I fired up 'Bailando' was revelatory for this system. Much more weight and power (and this was before I started tweaking crossovers and other settings). The upgrade was instantaneous and smile-inducing. After reading that amazing review you gave, I ordered a pair of those, I'm going in wall for atmos 5.1.4 or 7.1.2, maybe a can give a few suggestions. My question is where did you place your kefs in comparison to where you main seating position? Where they directly overhead, or slightly behind or slightly in front....what do you think of 7.1.2 in comparison to 5.1.4? Hi, ultraflexed. Thanks so much for reading and best of luck with your new Atmos cinema. It's a wonderful upgrade for home cinema and audio enthusiasts! For my review, I used a 7.1.4 Dolby Atmos configuration similar to the one pictured at the bottom of this page: http://www.dolby.com/us/en/guide/dol...-4-setups.html IE, I added four in-ceiling speakers to a traditional 7.1 speaker system. One pair of Ci200RR-THX speakers was placed slightly ahead of the main listening position, while the second was behind main listening position about halfway between that position and back-surround channels. Either way, that Dolby guide is pretty good way to approach 7.1.4, which is my favorite Dolby Atmos configuration thus far. Regarding 5.1.4 vs. 7.1.2, I think that's going to depend on each listener. I personally love my side surrounds, which is why I made the push the 7.1.4. If 7.1.4 is not an option, 7.1.2 and 5.1.4 are going to each have their benefits and drawbacks. The 5.1.4 system is going to have more accuracy for panning Atmos and DTS:X height objects, while a 7.1.2 system is going to be better with ear-level sound cues. I'm currently reviewing the Klipsch Reference Premiere Dolby Atmos speakers in a 5.1.2 configuration, which taught me two things: 1) two overhead speakers can do a great job with Atmos, but I prefer four overhead speakers for maximum impact. 2) If you only have 5 ear-leavel speakers, I prefer to place the two rear surrounds on the sides and behind the listening position by about 45 degrees (ala this image from Onkyo: http://res.cloudinary.com/hrscywv4p/...27ykxkqd4j.jpg). Some 5.1.4 systems, particularly those with Dolby Atmos up-firing speakers, place the rear channels behind the listeners (ala the second image here: https://www.kefdirect.com/index.php/...dule-pair.html), but -- for me -- this creates a hole in the sides. Looking closer at your comment, it appears as though you might not have a back wall in which to place speakers since you need to go in-cieling for "back surround" OR "rear height". If that's correct, maybe the compromise is to wire your ceiling with one pair in front of the listener, and one pair behind, then play with your setup, toggling those CDT 5800s between "back surround" and "rear height" to see what you prefer. I would bet, in that configuration, you'd want those rear height speakers to be "back surround" channels rather than height because they would be more active. Then you could KEFs as "front height channels" rather than "middle" (directly over the listening position). And, if you're ever able to add true ear-level "back surrounds", the others could easily become rear height channels. Regardless, please make sure to consult with your installer (or other forum members) because they will likely know more than me about your specific environment and needs. Good luck! Thanks for all the info, although I did order a pair of the kef's ci200rr thx in ceiling, my order got screwed up and my money was refunded, which sucked because I got a really really good deal on them. Doubltwing11, great looking theater. I too am planning on using CI200RR-thx for Dolby Atmos ceiling speakers. Also planning on using them for all the surround and back speakers. So I would be most interested to know how you got your back boxes constructed for them. Did you do them yourself? Or did you get a contractor to do them for you ? If you used a contractor, I'd like to know who it was. In either case, I would love to see plans for the boxes to get the precise 0.71 cubic feet as recommended by KEF. Quick question for the KEF Direct rep regarding these Ci200RR and Ci200QR speakers. I was visiting my favorite KEF retailer and they had a short stack of the Ci200QR speakers sitting there, awaiting installation in one of their demo rooms as part of an Atmos array. Telling me they were putting (3) of the Ci3160RL-THX speakers in the front wall, I commented that the Ci200RR would seem a closer timbre than the Ci200QR speakers. They said that the Ci200QR were chosen because there "essentially the speakers from the Reference series", without a box. In looking at the two versions and considering your nomenclature and KEF Direct pricing structure, it seems that the Ci200RR-THX is more akin to the standard R series speaker, while the Ci200QR would be better matched with the Q series loudspeaker line. Further, I would consider the CixxxCR series to be the proper association for the C series standard loudspeakers. I can't really imagine any in-ceiling or in-wall speaker being closely associated with the Reference loudspeakers. Who is closer to correct? Is there no clear lineage? You are correct in your assesment of the model numbers as it applies to our in-wall/in-ceiling offering. While the CixxxCR is part of the C Series, the CixxxQR is part of the Q Series and the CixxxRR is part of the R Series, there is a difference with the Ci200RR-THX. The main difference is the Ci200RR is actually the Q900 Uni-Q driver that is tweaked to the THX standard. That means a larger magnet, bigger tweeter and a few other enhancements that we made. I designed boxes myself based on Kef engineering specs...............sent to friend who has a CNC machine and constructed boxes myself. I used Kef spec-ed baffle cutout but fit was tight with speaker. Had to widen with jig saw. Quick question for the KEF Direct rep regarding the Ci200RR and the CI3160RL-THX. Can these be supplied with original KEF back boxes? In some pictures of the CI3160RL-THX, it seems there is a black back box? The Ci3160RL doesn't come with a back box. The previous speaker, the Ci9000, did come with a back box. We do have recommendation on volume of space between the studs. The minimum box volume we recommend is 0.53 cubic feet. The ideal box volume we recommend is 1.06 cubic feet. The Ci200RR doesn't come with a back box. The minimum box volume we recommend is 0.35 cubic feet. The ideal box volume we recommend is 0.71 cubic feet. Hi, The Ci3160RL doesn't come with a back box. The previous speaker, the Ci9000, did come with a back box. We do have recommendation on volume of space between the studs. The minimum box volume we recommend is 0.53 cubic feet. The ideal box volume we recommend is 1.06 cubic feet. The Ci200RR doesn't come with a back box. The minimum box volume we recommend is 0.35 cubic feet. The ideal box volume we recommend is 0.71 cubic feet. It looks like they are not on sale any more what's up with that? An update? I see the Ci200RR-THX on the KEF USA website, but no longer shown of the KEF Direct website. Is this because they can only be bought through an authorized dealer? Isn't KEF Direct one of them?? The Ci200RR-THX is still available and can be purchased. For the moment you can order them by visiting a local KEF retailer or calling into 877-271-9355. It will be back up on KEFDirect soon. I figured it was just a coding error or something like that. It's just too good of a product to stop making and selling them. It was not a coding error. We removed it for an internal reason. Internal reason? To a potential customer like me, that would come across as "we don't want to sell them direct anymore." a short question: which CI ceiling speaker will suit the best soundwise to the KEF LS 50? When you state "will suit" do you mean you would be using ceiling speakers in addition to LS50's? I would think that given the high quality nature of the LS50 you would be best to stick with the KEF ceiling speakers which have the "RR" suffix. Those appear to be only the one which is the feature article in this thread, the Ci200RR-THX. This is what I thought, too. Thank you very much for your advice!! I'm planning to build a LS 50 multichannel system, but a LS 50 ceiling mount would be difficult😉 Here in Germany you can still order the CI 200rr. Thanks again for your helpful advice!! I plan on getting these installed in my living area (just these, no in-walls. Also I have high ceiling- 18 feet). Primary objective is listening to music and secondary is TV. Will it be a good fit? The Ci200RRs sound great and are perfect for in-wall installations. If you're space permits it, I'd rather have floorstanding speakers. If not, you can't get any better than the Ci200RRs. I'd highly recommend a subwoofer to go with these. There are lots of great choices out there. I've had both PSA and SVS subwoofers and they've been great and both have unbeatable customer service. Call one of them and they can recommend a subwoofer to best meet your needs. Keep in mind that two or more subwoofers are best if you can afford it for best bass performance. If you need in-wall or in-ceiling, I'm uncertain as to which direction to point you as I'm not familiar with those. Check this page, anything with the "b" suffix is considered a subwoofer. Pay close attention, some require getting the matched amp. Thanks KenM10759 and zorax2. I will definitely go with sub woofers then. Will decide between free standing vs in walls. A store owner is arranging a demo of these speakers for me , cant wait for that. Also recommendation for a matching receiver/amp? One factor for the number of speakers may be the volume you intend to listen at. At high volumes, you will get a boost in capability with more speakers. If listening at moderate to low volumes, 2 to 4 speakers should be sufficient. The 18' ceiling height is the big variable as typical listening distances are often 8 to 12' and your seating positions will likely be farther away. The SPL calculator (http://www.acousticfrontiers.com/2013322spl-calculator/) may be helpful for you if you are curious about requirements for listening at high volumes. I'm more of a home theater person so I'm not sure what I'd do for someone like you who primarily listens to music. I've got 1 or 2 in-ceiling speakers in several rooms for our whole home audio system which is just fine for us as we don't listen to music at high volumes nor do critical listening to music. We're using much less capable in-ceiling speakers for that and I'm happy with them and wouldn't have spent the big bucks for the Ci200RR for those. Also, related to critical listening, the in-ceiling speakers will lose the stereo separation at that height with Uni-Q drivers wide dispersion. You're probably aware of that though. I've enjoyed Denon, Pioneer and Marantz AVRs and pre-pros. I'm happy with my ATI amps as well. Lots of choices depending on your budget and your end goals. Thanks again . Yes I thought so too. But given the space limits and orientation of my room, I believe this is the best route I can go to get the best experience for my room. 18 feet ceiling is at the end a risk but I dont think the audio quality will go that bad. Hoping it satisfies me. How thick is the front board where they go in. I am thinking of having them for surround and back as open speakers rather than in ceiling! Do you have a back box volume recommendation for the Ci200QR? You can see all the recommended volumes at the link below.